Erika Brady is currently a PhD Candidate at the University of St Andrews in the Handa Centre for the Study of Terrorism and Political Violence. Erika's undergraduate degree was in English and History, and she completed an MA in International Relations in 2002, both degrees at University College Cork, Ireland. In 2003, she obtained a Diploma in Journalism from the Irish Academy of PR and Journalism. Since then, Erika has worked in regulation, diplomacy and international policy around the world. Erika's thesis topic is on the evaluation of the UK's counter-terrorism strategy through a mixed methods methodology. This paper set out to explore whether the Syrian Conflict has impacted security issues outside its borders, in particular in Europe. With a wide range of challenges related to the conflict, now in its sixth year, issues such as the rise of ISIS and the refugee crisis in Europe have been linked to political destabilization on the continent and within the EU. By looking at data presented by the Global Terrorism Database and the United Nations Commissioner for Human Rights (UNHCR), this study set out to observe any patterns in Islamic terrorist activity and numbers of refugees in Europe during the period 2006 to 2015. Academic reports based on empirical studies as well as media reports were also analyzed to further the research and allow for in-depth assessment of the issue as a whole. Since the outset of the Syrian Conflict, Europe has been impacted by an unprecedented surge in refugees entering the region from beyond its borders, sparking a crisis in the European Union (EU), and has led to an increase in associated problems. In the first two months of 2016, 135,711 people reached Europe by sea and more than a million migrants are reported to have travelled to Europe in 2015 alone, by both sea and land. (BBC, 4 March 2016) The media would have us believe that racism and hate crimes are on the rise, with extremist views dominating all discourse. Political destabilization within the various countries of the EU and a push towards far right political parties has also begun to expose fractured societies and nationalist tendencies, showing a lack of confidence in existing political mechanisms to resolve 21st Century problems. Evidence of this lack of confidence can be most clearly seen in the UK’s recent Brexit referendum, held on 23 June 2016. Adding to this issue is an increased threat, or perception of an increased threat, of terrorism spreading from the war-torn region. The Syrian Conflict appears to have contributed, at least on the surface, to immense security challenges on a global scale. While every indication points to this conclusion, it is important to assess whether the available data supports this theory. In its Report Highlights, the Global Peace Index 2016 stated “Terrorism is at historical levels, battle deaths are at a 25-year high, and the number of refugees is at a level not seen in sixty years… The increase in terrorism across regions highlights the ability of terrorist groups to ‘export’ violence beyond national boundaries, as demonstrated by the increase in terrorist attacks in OECD countries in the past year. Similarly, the entanglement of more nations into the Syrian conflict, coupled with the enormous outflow of displaced people, shows that even internal conflicts cannot be quarantined and their repercussions can be felt across borders and even continents.” (Global Peace Index, 2016). The total number of deaths from terrorism globally is reported to have reached 32,685 in 2014 alone. (Global Terrorism Index, 2015) While not all of these fatalities have been as a result of Islamic terrorism, it is generally accepted that the high level of activity of Jihadi groups in recent years points to a significant portion of these fatalities resulting from ‘Islamic’ or ‘Jihadist’ terrorism. However, does the available data support this assumption? Can the Syrian Conflict be connected to this high death toll, particularly when looking at Europe? One of the purposes of this study was to explore this in more detail. Another aim of the study was to assess the impact of the Syrian Conflict on refuges flows into Europe, and to explore whether there are any connections to political issues on the European continent. Extreme views and a new wave of nationalism is clearly on the rise in several European states and on the surface, the surge in refugees has exacerbated these political challenges. An example of this can be seen in the UK, where various media outlets reported an increase in hate crimes following the Brexit referendum on 23 June 2016 in which the country voted to leave the EU with 52% of the electorate making this decision (Travis, The Guardian, 2016). High profile terrorist attacks in Europe since the outbreak of the Syrian Conflict have led people to believe that the movement of refugees from the Middle East is increasing security challenges. One of the most commonly cited reasons for the outcome of the Brexit referendum was the issue of immigration, but is there a ‘cause and effect’ event taking place here? The fear that immigrants and refugees will put undue strain on the existing resources of the various nations of the EU is augmented by the fear that terrorists are flowing into the continent amongst the Syrian and Iraqi refugees seeking asylum from the war-torn region. This is not a UK-centric issue, but has been taken up by far-right political groups and leaders across the continent. The research conducted for this paper focused on exploring the impact of the Syrian Conflict on Europe, a continent acutely feeling the strain of perceived security threats seen to arise out of the conflict. To carry out this research, a qualitative approach was taken, and I looked at three case studies reflecting the three areas identified above: terrorism, refugee flows and political and social challenges. First, a descriptive overview was provided for each case, along with the presentation of various media and expert analysis through reviews of the literature. Following this, I carried out an analysis of data contained in three data sources in particular: the Global Terrorism Database (GTD) and its associated reports; the United Nations High Commissioner on Refugees (UNHCR) global trends reports (2005 – 2015); and the Home Office report titled ‘Hate Crime, England and Wales, 2015/16’. While the focus of this study was Europe, some contextual oversight was necessary and some of the data reported in this study reflect global trends as well as those of Europe. Europe does not exist in a vacuum, and throughout the research for this paper it became clear that global trends were also telling in regard to European security issues. However, an in-depth analysis of the entire global implications of this prolonged conflict is beyond the purview of this paper. Several sources were included in the research phase, and provided useful insights and a broad scope for framing the premise of this paper, although they were not included in the paper directly. These included the research of: Ali Fakih and Walid Marrouch (2015); Sertif Demir and Carmen Rijnoveanu (2013); and Francois Heisbourg (2015-2016). Untold numbers of individuals act independently of ISIS but use it as inspiration, sometimes pledging allegiance to the group online (eg through Facebook) but receiving no formal training or instruction. In the UK, counter-terrorism forces have allegedly prevented numerous jihadi-inspired terrorist attacks from taking place, although information on these is usually not publically available. Whether or not an actual relationship exists between these individuals and ISIS, the inspiration to fight on behalf of the Caliphate seems to have had a noticeable impact on the number of people willing to carry out terrorist attacks worldwide. In many ways, these individuals, classified as ‘lone wolves’, are far more problematic than organized cells under instruction from ISIS, as they are often not known to authorities for their terrorist affiliations, although sometimes they are known to local police forces for criminal activities. An example of this can be seen in the case of Mohamed Lahouaiej-Bouhlel, the perpetrator of the attacks in Nice on Bastille Day, 14 July 2016. He was known to local police for various criminal acts, but had no known religious affiliations prior to the attack. Although Lahouaiej-Bouhlel was shot and killed by the police, ISIS, following a delay, did claim responsibility for the attack. This information has been verified across media sources, but as this attack took place relatively recently, it is challenging to verify any of this information independently, and care must be taken in these circumstances. Is there an increase in terrorist activity? The Global Peace Index 2016 reported “Increases in terrorist activity occurred across a number of regions, with prominent attacks occurring in France, Belgium, Turkey and Pakistan in the last six months alone. In total, 77 countries recorded a deterioration in the impact of terrorism, and of the 25 largest increases, nine occurred in OECD countries.” (Global Peace Index, 2016) Further, The Global Terrorism Index 2015 reported “Terrorist activity increased by 80 per cent in 2014 to its highest recorded level…Almost 60 per cent of the countries covered in the GTI experienced no terrorist deaths in 2014…However, a majority of countries did experience a terrorist incident of some kind…More countries than ever have high levels of terrorism.” (Global Terrorism Index, 2015) This report was based on data for 2014, the year that al-Baghdadi declared the Caliphate. It would not be until 2015 that ISIS would begin to seriously look beyond the immediate territory it had gained in Syria and Iraq to conduct attacks on an international level. Nonetheless, the data explored in the Global Terrorism Index 2015 shows the beginning of what seems to have become a growing trend in terrorist activity, primarily associated with ISIS. 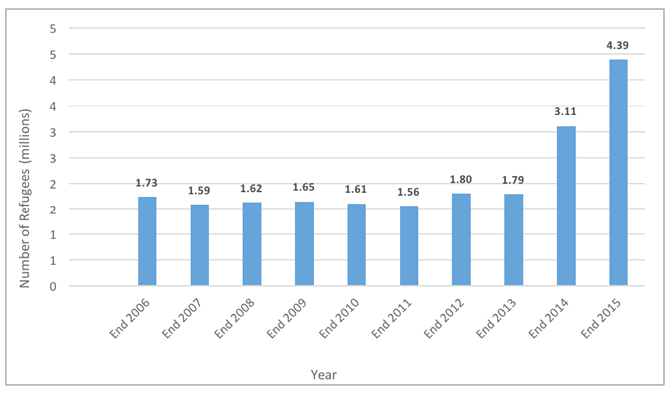 Looking at the chart in Figure 1, taken from data provided by the GTD for the period 2005 to 2015, we can see that a clear escalating pattern has taken shape. This data relates specifically to terrorist attacks conducted by ISIS (given its alternative name of ISIL in the GTD) or inspired by the group or its affiliates. The emergence of ISIS/ISIL in the guise we now recognize it is represented by the yellow line (starting in April 2013). Prior to this, various predecessors (Al Qaeda in Iraq etc) were in operation, represented by the grey line. Despite these organisational developments, it is clear to see that an increase in activity occurred from 2012 onwards, with the most significant ISIS/ISIL ‘spike’ taking place in 2014 (the highest point represents the month of September 2014 with 156 incidents). The blue line, indicating affiliate groups of ISIS, is represented predominantly by Boko Haram, the deadliest terrorist group in the world with 6,644 deaths attributed to the group in 2014 (ISIS is responsible for the deaths of 6,073 in 2014). The ‘spike’ on this line represents 179 attacks which occurred in July 2015. While the data indicate a drop in attacks for all groups towards the end of 2015, we are aware of several ISIS-inspired or directed attacks having taken place throughout 2016, for example the attacks in Brussels and Nice. Figure 1. Attacks carried out by ISIS/ISIL, its predecessors and affiliates between the years 2006 and 2015. (data taken from the Global Terrorism Database). The number of terrorist incidents in Europe have been low when compared to countries such as Syria, Iraq, Afghanistan and Nigeria. Indeed, the Global Terrorism Index 2015 states “The majority of deaths from terrorism do not occur in the West. Excluding September 11, only 0.5 per cent of all deaths have occurred in Western countries in the last 15 years. The West is designated as the countries where ISIL has advocated for attacks. They include the United States, Canada, Australia, and European countries.” (Global Terrorism Index, 2015) Nonetheless, media coverage on Western terrorist attacks magnifies the effects of what is, comparatively speaking, a relatively small number of successful incidents. This is not to say that terrorist plots are not a daily security challenge in Europe, and certainly the fact that security forces across the continent are on alert supports this. In the UK, for example, MI5 has set the terror alert level at SEVERE, the second highest level on the scale. A useful way to investigate whether ISIS, facilitated by the Syrian Conflict, has had a security impact in Europe is to look at the number of fatalities as a result of terrorism in the timeframe of the research. While this is not an infallible method of studying this issue, it does provide some scope for analysis, and the data, presented in Figure 2 below, is revealing. There are two obvious ‘spikes’ in the data, one in 2011, and the other in 2015. The 95 fatalities in 2011 were largely as a result of the two terror attacks carried out by Anders Breivik in Norway. While Breivik was a ‘lone wolf’ and in fact was fervently opposed to Islam, it was this opposition that helped to fuel his drive to commit the attacks and place his militant ideology on the world stage. In Raffaello Pantucci’s article, he found “Breivik sees himself as a crusader warrior fighting for Christendom…In this medieval light, Breivik’s concerns are focused around the growing Islamicisation of Europe and the ‘cultural Marxism’ that is allowing Europe to let itself get taken over by Islam.” (Pantucci, 2011) I therefore believe that it is not illogical to include Breivik’s data in this research. In 2015, 179 fatalities were the result, largely, of the attacks in Paris on 13 November 2015 in which 130 people died. When one looks at the data described in Figure 2, no clear pattern emerges. Two years out of a time span of ten years display significantly high fatalities, predominately from specific incidents, which are essentially outliers. There is no indication from this data of a growing trend of terrorist-related deaths over time. However, it remains telling that in 2015, the year when ISIS became more active in the international domain, a high fatality rate for a relatively small number of attacks occurred. As there is currently only data available in the GTD covering the time period to the end of 2015, it is difficult to observe a true pattern of ISIS-related attacks in Europe in one year alone. However, the clearly large number of fatalities in 2015 when ISIS was highly active internationally indicates that the group has had some impact on Europe, although a causational relationship remains elusive. Figure 2. 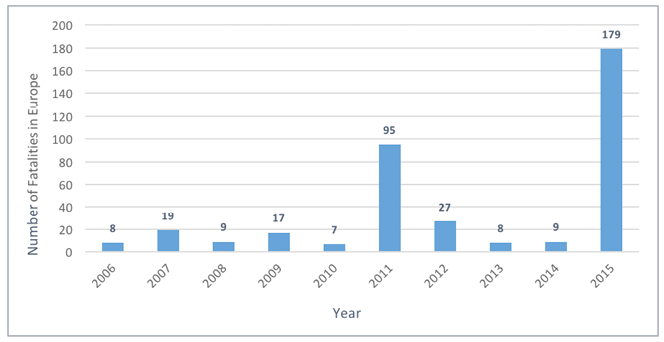 Number of fatalities arising from ISIS-related attacks in Europe between 2006 and 2015. (data taken from the Global Terrorism Database). The interconnected challenges that have been compounded by the rise in terrorist attacks are multifarious, but in particular, terrorism’s perceived connection with refugees and the movement of populations is glaring. Indeed, the Global Terrorism Index 2015, in looking at the impact of terrorism in Western Countries, noted that “Terrorist activity is a significant driver of refugee activity and internal displacement. The countries which are the greatest source of refugees and internally displaced people also suffer the most deaths from terrorism.” (Global Terrorism Index, 2015) The next section will address the issues arising from the refugee crisis in Europe and will explore whether the Syrian Conflict impacted trends in the movement of refugees. Attempts have been made by the EU to address the crisis, with limited success. A quota system was implemented in September 2015, which aimed to move refugees landing in countries such as Italy and Greece to other countries in Europe, but not all states agreed to adhere to it. In particular, the UK opted out of the quota system. (BBC, 4 March 2016) In March 2016, Turkey made a deal with the EU in an attempt to address the refugee crisis. However, following the failed attempted coup in Turkey on 15 July 2016, the number of refugees increased dramatically, with reports of almost double the number previously seen arriving on the Greek islands in the Aegean. While European governments struggle to manage the refugee crisis, this situation in the refugee camps is abysmal. Without the opportunity to gain employment, or integrate in any way with the society in which they are based, it is not difficult to envisage bitterness, and potentially animosity, towards countries who cannot decide on how best to deal with them. “The existing literature on radicalization in crisis situations typically identifies three drivers of radicalization: the existence or pervasiveness of an Islamic education; the ability to find gainful employment; and the ability to have freedom of movement (encampment vs. open camp policies).” (Martin-Rayo, 2011) With the pressures and frustrations this can espouse, the scene is set for a new generation of young disenfranchised people who have grown up in refugee camps and completely alienated from the societies in which they are based. However, does this necessarily mean that these people will resort to terrorism or violence? In fact, more often than not, the research into this phenomenon has shown that the risk of refugees engaging in terrorism is no higher than the risk of any other disenfranchised group doing so. While the risk of radicalization is a real one, particularly following recent reports that ISIS is recruiting from refugee camps in Europe (The Guardian, 2 December 2016), many of the perpetrators of the terrorist attacks in Europe have had roots in the continent, and initially travelled to Syria as ‘foreign fighters’ (Funk & Parkes, January 2016). While radicalization within refugee camps in Europe is a possibility, ISIS need not necessarily go to such lengths to achieve its goals. Funk and Parkes discuss ISIS’ goal as wanting to provoke certain “political and social reactions”, doing this through the spread of misinformation and, as a result, provoking fear in the populace. They go on to say that it is not newcomers, but second and third generation immigrants who seem most prone to radicalization (Funk & Parkes, January 2016). In September 2016, Special Rapporteur on counter-terrorism and human rights Ben Emmerson, presented a report to the UN General Assembly in New York. This report noted that there is little evidence that terrorists take advantage of refugee flows to carry out acts of terrorism or that refugees are somehow more prone to radicalization than others. Further, research has shown very few refugees have carried out acts of terrorism (UN Report, September 2016). The report goes on to say that state reactions to the flows of refugees have been focusing on security perspectives. “However, asylum and migration policies that are restrictive or that violate human rights can have a counterproductive effect on the efforts of States to counter terrorism by creating more irregular immigration and increasing violations of the human rights of migrants and refugees, marginalizing particular communities and reducing prospects for migrants, all of which could become conditions conducive to terrorism… It is also possible that the stigmatization of certain communities is precisely what terrorist groups seek and may lead to an increase in support among migrant communities.” (UN Report, September 2016). The immigration crisis in Europe continues apace, and analysis has shown that, by not addressing the crisis, prolonged security issues will continue into the future and should be considered on a generational time frame rather than one of mere years. It seems clear that the situation in Syria has increased the number of displaced peoples, and so terrorist activity as well as civil conflict have had an impact on refugee flows. However, the connection between refugees and terrorism is elusive and more complicated. While there is much debate on the propensity of refugees to become radicalized, it seems that the current research supports the notion that state policies directed at the crisis are not necessarily reducing related security challenges, but are potentially more likely to increase them. In looking at Figure 3, based on data from the UNHCR’s Global Trends Reports from 2006 until 2015, a clear and sudden increase in the number of refugees recorded as entering Europe can be observed in 2014. The increase coincides with the declaration of the Caliphate by ISIS. Vast amounts of territory in Iraq and Syria were captured by the group at that time, and it seems likely that this was one of the contributing factors to the sudden and dramatic increase in population displacement from 2014. Between the beginning of 2014 and the end of that same year, the number of refugees recorded in Europe increased by 74.3%. The next highest increase in yearly intake was in 2015, with an increase of 43% in that year alone. This data shows that there was an initial small increase in refugees arriving in Europe coinciding with the outbreak of the Syrian Conflict in 2011. Following the rise of ISIS and its seizure of territory in Iraq and Syria, there was a significant increase, as can be seen in the recorded numbers of refugees in Europe in 2014 and 2015. Conflict, as well as a desire to live in a free society as opposed to living under Sharia Law in ISIS-controlled territory, can be seen to have driven increasing numbers of people from their homes. While the vast majority of these people have been displaced within Syria or in the countries neighboring the war-torn state such as Jordan and Lebanon, those who feel it is necessary to risk the dangerous journey to Europe have clearly increased in numbers since 2014. While the connections are not causational, the empirical data certainly supports the supposition that Europe has experienced a large increase in refugees coming from Syria and Iraq. Whether the Syrian Conflict itself has directly impacted this movement of people, or whether the conflict created a climate in which ISIS was able to thrive and from which people felt forced to flee, is nuanced and unresolved in this research. However, the likely combination of both factors has undoubtedly driven people from the war-torn region, and for this reason, it can be concluded that the Syrian Conflict has had some impact on the immigration challenges facing Europe. The apparent increase in terrorist acts or the threat of terrorist acts carried out by or inspired by ISIS, and the rise in numbers of refugees from that region coming into Europe, combined to create a potent climate of fear and anger in the already fragile EU region. These two security challenges, terrorism and refugee flows, have created the most significant political de-stabilization on the continent since the end of World War II. Both at EU and national level, governments are struggling to address the concerns of their populations, and the political fallout is continuing apace. The next section will address the social and political issues arising from the terror attacks and the refugee crisis in Europe and will explore whether the Syrian Conflict has impacted issues such as hate crimes. Right wing politicians and a resurging nationalist movement, have used the issues of terrorism and immigration to promote an atmosphere of fear and uncertainty among the populations of Europe. Nowhere has this been more clear, or indeed successful, than in the UK. This climate of uncertainty and frustration resulted in a vote to leave the EU in the Brexit referendum on 23 June 2016. The decision to leave the EU continues to have ramifications for both the country and Europe as a whole. Within hours of the decision, the political backlash in the UK became evident: David Cameron resigned his position as Prime Minister; Nigel Farrage, the leader of the United Kingdom Independence Party (UKIP) also resigned; the Labour Party, the opposition party in the UK, began what has become an extended crisis of faith in its controversial leader, Jeremy Corbyn (following Brexit, the party lost over 20 members of its shadow cabinet); and Scotland, which voted overwhelmingly to remain in the EU, raised yet again the specter of separating from the rest of the UK. Economic impacts have also been felt, as markets struggle to predict how this impending separation will take place and what role the UK, separate from the EU, will have in the global context. While some of the many concerns Orban raised may be dismissed out of hand as rhetoric, the perception or belief that this is the situation is sufficient to impact the political systems throughout the continent. The narratives in France’s upcoming presidential elections appear to support the strong possibility that Marine Le Pen of the National Front (a right wing political party) will become the next French president, and populations are polarizing within most states. With issues such as the ‘burkini ban’ in France and attacks on Mosques throughout the continent, the fear of Islamic terrorism has never been more prevalent, and there is a clear impact on society and how safe populations perceive themselves to be. The rise of nationalist movements and far-right extremist views across Europe has become a significant concern for those who support centrist notions and liberalist views, including human rights. The dissatisfaction with the status quo has become a wide-reaching topic, affecting all levels of society. The UK’s wish to return to an independent state, closing its borders against both refugees and other migrants, is a symptom of an era of uncertainty and change. Right-wing parties have been gaining ground in Europe, as the electorate seek parties outside of the mainstream, with notable examples being the UK, France, Austria, Hungary, the Netherlands and Poland. Additionally, we can see a rise in radicalism across the continent. As of December 2015, it is reported that 27,000 people from 86 countries have travelled to Syria and Iraq, ostensibly to join ISIS. Of that number, 5,000 are estimated to be from Europe. (The Guardian, 8 December 2015) In particular, the conflict in Syria is considered to have become the most significant “mobilizer for Islamists and jihadists in the last 10 or 20 years with more people from Europe being mobilized than in all the other foreign conflicts that have happened for the past 20 years combined. (Lister, 2015) What motivates these individuals to travel to a conflict zone to protect people who have little or no connection to them, is unclear, and again the subject of much debate. Undoubtedly, the inhospitable climate in Western countries where many of these ‘foreign fighters’ originate is a contributing factor. Frustration with the political and social systems and an apparent relish among media outlets to highlight stories which undermine migrant communities cannot help. These disenfranchised people are being trained and combat-hardened in Syria, and when the conflict does eventually end, or when ISIS is militarily defeated, they will have limited opportunity to use their combat skills, other than to perpetrate harm back in their home countries. Returning foreign fighters could have an impact on Europe for decades to come. Governments are struggling to off-set this threat, to varying levels of success. One of the more negative impacts of these fears has been an increase in hate crimes, particularly those which are motivated by race or religion. However, while the media has highlighted these acts, is there data to support the alleged rise in hate crimes in the UK around and following the Brexit referendum? Below is a brief analysis of the data on this issue. Was this simply fear-mongering, or was this an actual issue in the UK? Further, with regard to the research carried out for this paper, can it be linked to the Syrian Conflict? The Home Office published a statistical bulletin in October 2016. (Corcoran & Smith, 13 October 2016) In this document, five strands of hate crime were identified: race or ethnicity, religion or beliefs, sexual orientation, disability, and transgender identity. “There were increases in offences recorded for all five of the monitored hate crime strands between 2014/15 and 2015/16.” For the period 2015/16, the police recorded 62,518 hate crimes, of which the majority (49,419 or 79%) were race hate crimes. The third highest category of hate crime was religious in motivation, with 4,400 incidents (7%). This paper focuses specifically on these two strands as being particularly related to Brexit and population concerns with terrorism and immigration. This data shows that there was a clear increase in hate crimes relating to race and religion following the Brexit vote. This increase has now leveled off, although the numbers remain higher than in 2015. This data potentially indicates a pattern of increased violence in this area, although the impact of Brexit which was used as a political platform to drive support, is an obvious outlier and not necessarily indicative of a steady increase. Nonetheless, even a cursory analysis of media reporting shows that issues such as the threat of a terrorist attack or the large numbers of Syrian and Iraqi refugees fleeing conflict and ISIS had a tangible impact on how people voted. The hope that the UK would be safer and more prosperous out of the EU resulted in a win for the ‘Vote Leave’ camp. Connecting the result directly to the Syrian Conflict is difficult, and has not been achieved in this research. However, as issues related to the conflict continue to play an important role in policy-making and electoral platforms, it can be concluded that some relationship does in fact exist. The research carried out for this paper provided an overview of the impact of the Syrian Conflict on international security challenges, with a particular focus on Europe. The displacement of millions of people in fear of their lives, the destabilization resulting from this mass mobilization of populations and the apparent increase in global terrorist activities as indicated above can all be seen to coincide with the outbreak of the violent and prolonged conflict taking place in that country. Further, both of these factors appear to have impacted on population concerns and political instability throughout the continent. Through this research, I was able to draw reasonable conclusions and address the questions posed by this paper. By observing the data of the GTD, the UNHCR and the Home Office, it was made clear that there was an overall increase in terrorist attacks worldwide (as well as the OSCT countries) since the outset of the Syrian Conflict and there has been an exponential increase in refugees from the area of the conflict entering Europe. Whether there was an increase in terrorist attacks and fatalities in Europe in light of the conflict was not discernable within the parameters of this study. However, with a high death toll in Europe in 2015 as a result of ISIS-inspired or directed terrorist attacks, some impact was implied and will be an interesting subject for future research. While it cannot be irrevocably stated that these security challenges would not exist at all without the Syrian Conflict, the research conducted for this paper shows a clear relationship between the situation taking place in Syria and a number of security challenges occurring in Europe. Academics such as Jonah Schulhofer-Wohl have found in their research that the conflict in Syria, while adapting with the changing political landscape, will continue to shape the Middle East region and continue to see a rise in extremism (Schulhofer-Wohl, 2013). This is a very bleak picture and one that indicates the patterns of increased destabilization and crisis arising from the bitter conflict taking place in Syria are set to continue for some time. While the data analysed in relation to terrorist attacks in Europe ends in December 2015, several significant attacks took place throughout 2016. In particular, high-profile attacks such as the coordinated attacks in Brussels and the attack on Bastille Day celebrations in Nice resulted in high death tolls. A number of other smaller attacks took place, particularly in Germany with either low or no fatalities, although in most cases people were injured. Overall, 11 significant attacks took place in Europe in 2016, with at least 129 deaths and hundreds injured (figures include the deaths of perpetrators). While this shows a decrease in fatalities in 2016 over 2015, as the second highest death toll since 2005, it nonetheless indicates a pattern of high impact terrorist attacks, primarily related to ISIS. The organization known as the Islamic State has progressed through a variety of names as it has developed, and these are used without consensus by different experts and organisations. Initially set up as the branch of Al Qaeda in Iraq, it broke ties with that organization and first named itself Islamic State of Iraq and the Levant (ISIL). This was followed by the name the Islamic State in Iraq and Syria (ISIS). It has also become commonly known as simply the Islamic State, thought to be a propagandist move to indicate the Caliphate as applying beyond the Middle East. More recently, it has become widely known as Daesh, which is an acronym for the Arabic phrase “al-Dawla al-Islamiya fil Iraq wa’al Sham” (Islamic State of Iraq and the Levant). Apparently, this title is not viewed favorably by the organization because it is similar to the Arabic words ‘Daes’, ‘one who crushes something underfoot’ and ‘Dahes’, translated as ‘one who sows discord’. For the purposes of this paper, I use the term ‘ISIS’. The Global Terrorism Database, on which this research relies, uses the term ‘ISIL’. Erika Brady is a PhD student at the Handa Centre for Terrorism and Political Violence at the University of St Andrews. Erika’s current research looks at the UK’s CONTEST strategy through a mixed-method approach. Erika is a tutor at the School of International Relations at the University of St Andrews, and has acted as Guest Editor on the Special Issue of the Journal of Terrorism Research “Security and Counter-Terrorism Challenges arising from the Syrian Conflict.” Erika has also published articles for the St Andrews Economist and Sicherheitspolitik-blog, an academic blog hosted by the University of Frankfurt. Demir, S & Rijnoveanu, C, The Impact of the Syria Crisis on the Global and Regional Political Dynamics, Türk Dünyası Đncelemeleri Dergisi / Journal of Turkish World Studies, XIII/1 (Yaz 2013), s.55-77.